Wayne Parker is a certified life coach and the author of the parenting book "Power Dads." The Nintendo Wii is one of the most popular video game systems ever created. The games on this list are specially selected because they allow a lot of interaction between players and they are fun for players at all levels. 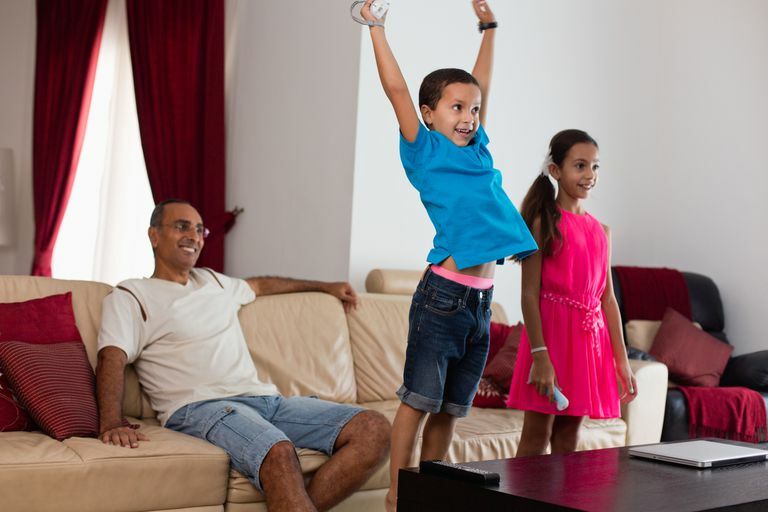 If you like playing Wii games with your children, then this list is for you. If you loved Mario Kart for other Nintendo units (like DS or Game Cube), then the Wii version will really be a pleaser for you and your family. Graphics are amazing, the maps are creative, and the ability to race other players online (up to 12 at a time) makes it a real kick. Think of being able to race your kids and their out of town cousins next Saturday. This is a great use of the Wii technology, and to make it great, you will want the Mario Kart wheel Wii accessory. My kids can't appreciate my love for the pinball games of my youth. Hours and hours spent pumping quarters into the pinball machine at the local miniature golf center honing my skills was among my favorite pastimes. This game is easy to learn and fun to play, and your kids will become addicted to Pinball Hall of Fame. This is the second installment in the Boom Blox series. Boom Blox is a really fun concept in which game players strike at or pull out blocks from a variety of structures. The characters in Boom Blox are entertaining and engaging and the tools for striking blocks now include various shapes like cylinders and wedges. They are fired with cannons, slingshots and other implements. The colors and sounds are bright and loud — just like dads and kids like. Remember the lazy summer afternoons at the neighborhood park playground? Playground for Wii is a sporting game that includes virtual activities like tetherball, dodgeball, lawn darts, slot car racing, and paper airplane competitions are available for you and your kids to enjoy. The graphics are colorful and fun, and the action realistic. If you like any Wii games, you will enjoy the ones offered in Playground. Once again, this game is a real throwback to the carnivals of bygone days at the County Fair or the local carny. Think ring toss, lucky caps, dunk tanks, shooting gallery as carnival games. And you can visit a swami or a fortune teller. Step right up and experience this game with your family! I am a big fan of Sports Resort. It is one of my family's favorite games. Power cruising, disc dog, archery, fencing and more. It is ​a pretty good exercise for some of the couch potato dads and kids, and the graphics are extraordinarily fun and enticing. You will want to have a number of Wii accessories and Wii Motion Plus to enjoy these games to the max. Star Wars has long been a favorite franchise for fathers and children alike. In this latest version of Star Wars Lego games, there are game units that reflect all 6 Star Wars movies. The games actually require players to use team-building and cooperation skills, so there are even life lessons available as the game is played. With over 160 different characters, every game played is unique and different. Another Lego classic, Indiana Jones 2 is really an adventure. Taking its theme from the Indiana Jones movie series, this game allows the player to collect historic artifacts which then unlock various characters and levels which test the player's skills and creativity. With many new vehicles, weapons, and characters, this game will immediately engage adventurous children. Based on the I Spy book series, these games are challenging for older children and dads. This is not a game that children under about 7 years old will enjoy. But for older kids and dads, this will be a really fun game experience. The graphics are very cool and the game is full of riddles, excellent character action and simulations, and great games involving darts, paddleball and more.